By Thursday morning, the photo had been retweeted more than 9,200 times. A powerful photo featuring Howard University students protesting the shooting of an unarmed Missouri teen is the latest image to capture the strong emotions over Michael Brown's death. Brown, 18, was shot multiple times by a police officer after authorities say he was involved in an altercation with the officer Saturday night. The death of the unarmed African American teen has incited protests nationwide and stirred race relations in the small St. Louis suburb of Ferguson. Captioned with the hashtag, "Don't shoot," the Howard University photo, taken by student Ikenna Ike, shows hundreds of students at their freshman orientation with their hands outstretched. By Thursday afternoon, the photo had been retweeted more than 9,200 times, becoming a symbol of solidarity in the few hours it's been online. Howard University sophomore Khalil Saadiq, the director of Student Advocacy for the Howard University Student Association, said the photo was his idea. "The way people are behaving -- they're being villainized. We just really wanted to get some positive media circulating about what people are doing in light of what's happened," Saadiq said. Howard University alumna Mya Aaten-White said she was shot in the head while protesting in Ferguson, Missouri, Wednesday. News4's Kristin Wright reports. The passion felt amongst the students filled the auditorium, Saadiq said, adding that the attention the photo has received is "well deserved and long overdue." "This man was in the least dangerous position you can be in, signifying that I don't want to get into a violent altercation. I'm innocent. I don't have a weapon. That normally signifies for the officer to approach, not to shoot," Saadiq explained. Witnesses say Brown's hands were raised in a similar fashion at the time of the shooting; police have not confirmed this detail. In the days since his death, "Hands up, don't shoot," has become a rallying cry for protestors. For four days, law enforcement officers in riot gear have clashed with protesters in Ferguson. Wednesday saw more tense confrontations with continued volleys of tear gas from police. Smoke bombs were also thrown in response to flaming projectiles and other objects lobbed from the crowd. Mya White, a Howard University alumna and activist who was among the protestors in Ferguson, suffered a gunshot wound during Wednesday's events. Our prayers are with alumna Mya White & her family. The senseless gun violence has to stop. As a nation, we must stand against the violence. 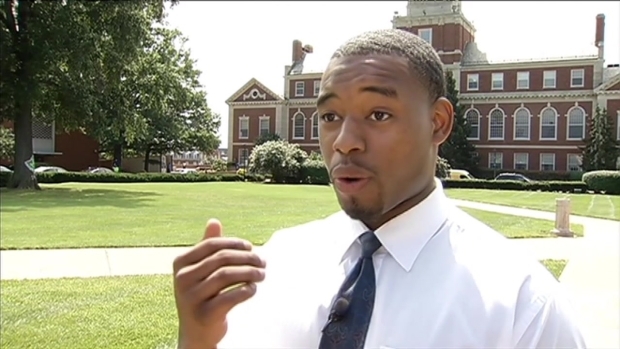 Howard University, a historically black university located in Washington, D.C., will hold a prayer vigil for Brown Thursday at 8:30 p.m. on Main Quad, also known as "The Yard." Thursday night, more than 90 vigils will be held nationwide to honor victims of police brutality, according to the Facebook page for the National Moment of Silence 2014. Locally, vigils will be held at 7 p.m. in Malcolm X Park in D.C., the commuter lot at Minnieville Road and Dale Boulevard in Woodbridge, Virginia, and Susan Campbell Park in Annapolis, Maryland.